Iron Jack Multi-function Workout Station and Power Tower is designed for a complete body workout (mainly targeting upper body and abdominals) by letting you do a variety of resistance / strength training exercises including dips, sit-ups, chin-ups, pull-ups, VKR- vertical knee raises and bench press by using the pulley system or resistance bands (you’ll find two resistance ropes- 20 and 30 pounds) that are included in the package. The sit-up bench seems nicely padded and comfortable enough and is adjustable for flat and different incline positions and includes foam leg rollers. It has a solid steel frame and overall build with a user weight capacity of 220 pounds, has anti-slip foot grips and the comfort of thick cushion padding of arms and back. The unit is peak-adjustable for height between 71 and 91 inches to accommodate taller and shorter people and adjustability is also great for lower ceilings. It is not shipped assembled so you will need to put it together by the tools and instructions provided which are not very useful but is easy to assemble in less than an hour if you have the assembly experience with similar units. Iron Jack appears to be the only one with chin-up adjustment so if you’re tall and have low ceilings this will be very convenient to use. If you want to put it in your basement it will fit fine in small basements with low ceilings. It has a small footprint and does not occupy a lot of space, not super stable as it may wobble a little if you are heavier than say 200 pounds so it is not really commercial grade but good enough for home use: Good quality, multi-functional and user friendly. 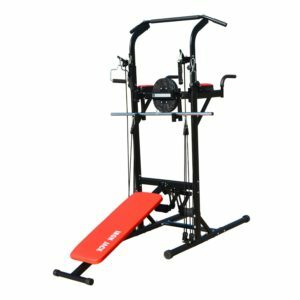 For the low price point it is nice and functional, well-designed and well-made enough and does the job for casual home gym use. You can strengthen and tone your biceps, triceps, back, chest and abs by different hand positions. 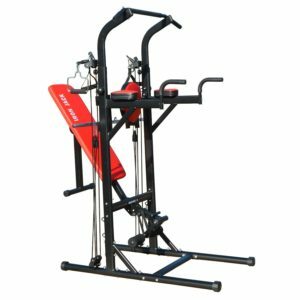 You will be happy with this product as long as you don’t have very high expectations, and if you do you really need to invest more money for a sturdier commercial gym level unit with extra bells and whistles and larger footprint for added stability. We don’t have the information on warranty offered and you may contact the seller directly. Overall this is a decent multi-function workout station for the price for those that don’t have a lot of time, energy or money for going to a gym regularly.